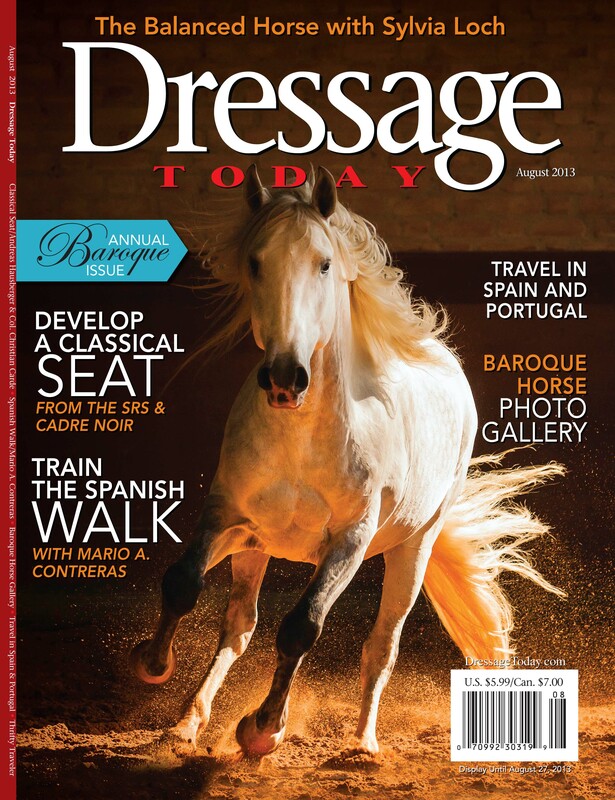 Check Out the Balanced Horse Feature by TSB Author Sylvia Loch in the August Issue of Dressage Today! Pick up a copy of the August issue of Dressage Today for a great excerpt from TSB author Sylvia Loch’s new book! TSB has a lot to be proud of in the August issue of Dressage Today magazine, with special sections by authors Susanne von Dietze (BALANCE IN MOVEMENT and RIDER & HORSE BACK TO BACK) and Janet Foy (DRESSAGE FOR THE NOT-SO-PERFECT HORSE), as well as a travel piece and cover photo by photographer Keron Psillas (MEDITATION FOR TWO and the forthcoming THE ALCHEMY OF LIGHTNESS). In addition, the “Annual Baroque Issue” features an excerpt from Sylvia Loch’s new book THE BALANCED HORSE: THE AIDS BY FEEL, NOT FORCE, which is now available from the TSB online bookstore (CLICK HERE TO ORDER). Take a close look at this photo from the book and see if you can name the celebrity in the audience! See if you can spot the celebrity in the audience at this Sylvia Loch clinic! Be sure to pick up a copy of the August issue of Dressage Today magazine, wherever quality equestrian magazines are sold. 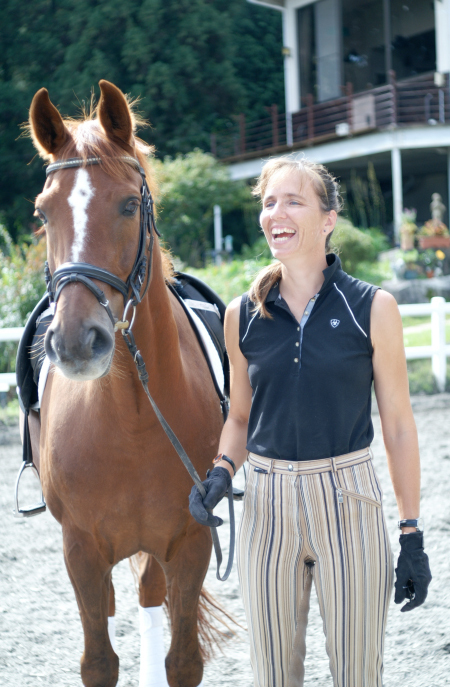 Susanne von Dietze, author of the new book RIDER & HORSE BACK TO BACK, balances a busy teaching and riding schedule with raising three children. This month, Trafalgar Square Books caught up with Susanne von Dietze, author of the bestselling BALANCE IN MOVEMENT and the new book RIDER & HORSE BACK TO BACK, and asked her what it was like juggling horses and family, among other things! TSB: You manage to have an active teaching schedule while competing a Grand Prix dressage horse and raising three children. I’m certain many riding mothers with competitive ambitions wonder where you find the time to do it all, and if you have any advice for making a riding career work while raising a family? SvD: I ask myself the same question sometimes! Well, one big part of my career is my husband, who always backs me up and is a wonderful father—living on a Kibbuz helps, as all the facilities for the kids (school, tennis, swimming pool, basketball courts…) are within walking distance. And, when I was pregnant with my third son, I turned my horse into a schoolmaster for a good friend. My mare taught her dressage, from elementary level all the way up to becoming National Champion in Israel at Intermediaire Level, while I rode as much as my time allowed in the training. TSB: What are your personal riding goals for 2011 and beyond? Susanne has made a name for herself by integrating her experience as a physiotherapist (specializing in the back) with riding. SvD: My personal riding goal is that when I get off a horse, the horse is glad that I rode him! This season I will compete on a Dutch stallion that is a champion show jumper in Israel, and the owner now wants to see how far he can get in dressage, there are some nice young horses that I am helping along…And with the children growing up, I hope that one day I will find the time to bring a horse for myself over from Germany again! SvD: I would probably choose a Thoroughbred, even though some coldblooded Shire horse or the like would make more sense to work the “fields” (on the island)…And I have too many good books to choose. SvD: I am living pretty close to it! SvD: It was my first attempt to jump an upright cavalletti, and I did not fall at the jump, but when I proudly turned around after the jump to look and see what it was I could now do! I fell off in the corner after the jump, when the horse turned while I went straight on! I learned not to look back at jumps in that lesson! SvD: Enjoying learning together with me and forgiving my mistakes! SvD: Morning training on a racecourse. SvD: Not having to cook it! SvD: We did a family bicycle tour through Poland this spring, and that came pretty close to it! SvD: My mother. She always could put me back on my feet, and knew just what to ask. She died this May and is missed dearly. 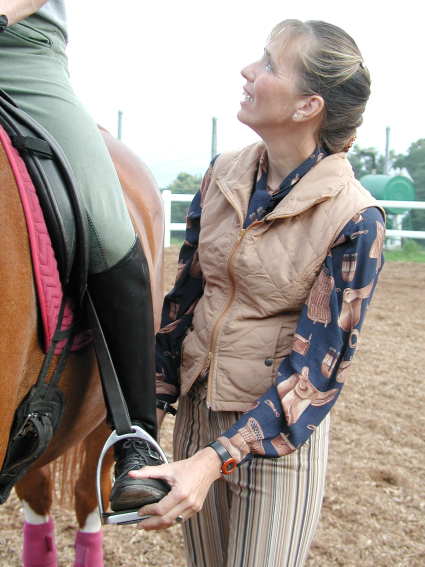 Susanne’s books BALANCE IN MOVEMENT and RIDER & HORSE BACK TO BACK, as well as her DVDs by the same name, are available at the TSB online bookstore, where shipping in the US is always FREE.